Use when parapet extends above the roofline. Eliminate the need for jumping off the ladder to the roof, helping to keep technicians safe. Saves wear and tear on the roof & parapet reducing repair costs. Mount on one or both sides of Parapet Back Ladder System with 3 or more steps. Allows the user a secure hand hold when climbing the Back Ladder. A grab rail (similar to the LadderPort grab bar) provides an added measure of safety when at the top of the Parapet Back Ladder. Sold with additional wall mount support to keep parapet back ladder solidly on the ground. 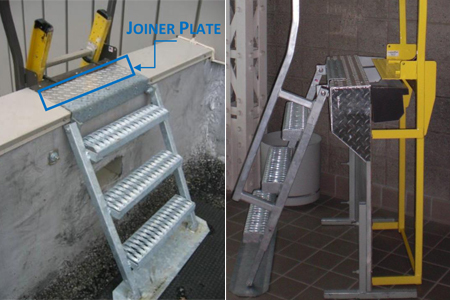 For a cleaner, more solid installation, we recommend a joiner plate to help protect the parapet wall. If the parapet width is provided we can provide a cut to measure plate or our standard 17” plate can be field cut to size. Larger widths available by request.